Supply Chain Management is complex and truly mastered by few. Building the organizational capability which orchestrates a multitude of activities that manage inventory, cost, and service is a challenging goal – one that requires strong alignment between Strategy & Governance, Operational Excellence, as well as the organization’s people, processes, and systems. 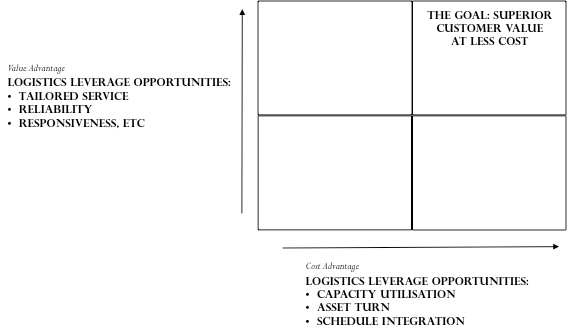 For those seeking this holy grail, at its foundation, excellence in the supply chain is measured by an organization’s capability to achieve the right balance between service and cost. But it’s not nearly this cut and dry -- different business units within the organization typically require their own unique equilibrium of service and cost advantage, and it’s this factor that will drive the type of focus needed, and the capabilities required in each situation. Supply Chain Strategy must be inextricably linked to the strategy of the organization. This enables the necessary capabilities to support the aims of commercial business to be reflected directly into the supply chain design. Determining where to focus both capabilities and resources will be driven by key objectives, the current level of supply chain maturity, and business challenges. Refreshingly, there is no right or wrong answer – the company must make choices about the type of people, processes, and systems needed to respond when the market seeks an output. In a nutshell, Supply Chain Strategy is about enabling a company to meet its goals and achieve a competitive advantage. The competitor with the most responsive, efficient, balanced Supply Chain wins. The nature of the business, the type of products, and the mission of the company will drive differences in supply chain design and the type of capabilities needed. A life sciences company, for example, may focus more heavily on responsiveness and service with less emphasis on cost than a fast moving consumer goods company, reflecting both the nature of the products and the relative margins. Done right, an adaptive Supply Chain can be a source of competitive advantage, as demonstrated by companies such as Apple, Wal-Mart, and P&G. But when improperly misaligned, impacts to service and cost can be detrimental. Responsiveness: Time-based competition is now the norm, with customers requiring quicker availability and higher levels of customization. The focus is on agility. In organizations where this is critical to competitive advantage, strategies need to be adopted to enable the speed of change and faster response to market needs. Reliability: Unreliable processes create uncertainty and variability. Equally, the lack of visibility adds to the uncertainty. Where reliability is key, management of uncertainty may require closer collaboration with external parties and optimization of end-to-end (E2E) inventory levels aligned to the segmented trade-off between service level and cost. Resilience: Today’s turbulent and volatile markets require supply chains that are capable of dealing with the unexpected and the unplanned. Contingency strategies, risk modeling, and responsiveness to the scenario “what-ifs” must reflect a company’s ability to truly respond. This ability to “bob and weave” becomes critical. Relationships: As supply chains become more complex and as out-sourcing increases dependency on suppliers, the need for relationship management increases and the importance of internal and external collaboration as a fundamental people capability is essential. Having trusted partners can become the ultimate chess play if a “what-if” scenario becomes reality. - Synchronized (E2E) planning capability – aligning production to the end-customer demand, therefore reducing the bullwhip effect and driving improved stability. Critical to aligning operational effectiveness with the desired outcome of the Supply Chain strategy is Business Intelligence. This extends beyond just the proficiency to measure performance, but rather, strives toward best in class operations that include the analytical expertise to monitor the E2E operation proactively responding to risk, imbalances, cost deviations, and service levels in a way that is consistent with the goals of the segmented customer value proposition. Excellence in Business Intelligence requires a combination of people proficiency, systems capability and data accuracy and completeness that enables correct decisions to be made at each point in the chain. Proactively managing “what if” scenarios with the data possible to model the cost impact versus service implications allows for trade-off decisions to be made in a more informed manner. For the advance Supply Chain enthusiast, a more advanced level modeling capability supported through excellence in Business Intelligence enables multi-echelon inventory optimization, capacity decisions, cost to serve reduction initiatives and risk assessments to be executed more effectively. Tools such as a balanced scorecard, supported by effective Business Intelligence, underpins a clear understanding of the actual performance, and, if done right, enables senior leaders to understand whether the company is on course -- or not. Now clearly, this is not an exhaustive list, nor is it comprehensive to all of the practices an organization must master to achieve Supply Chain Excellence. But for many, if organizations could enhance, improve or simply make positive steps forward, on any or all of these practices, they may indeed find themselves differentiated in the marketplace with which they serve. Joy Taylor is a regular contributor at SupplyChainOpz. She is the Co-founder and CEO of TayganPoint Consulting Group. Taylor has over twenty years of cross-functional experience in Lean Sigma, team facilitation, program management, project leadership, and communications and change management.